One building stone and one altar are the meagre pickings from this stretch. We find the Second Legion building the Stone Wall here (2054), presumably during the initial replacement of the Turf Wall, whilst the altar for the mother goddesses now at Port Carlisle (2055) probably comes from the nearby Milecastle 79. Time and erosion have deprived us of the inscriptions on the two Roman altars that stand outside Drumburgh Castle, but there are a few legible inscriptions from the site. The two stones erected by the Seventh and Eighth Cohorts (2051-2) must date to the replacement of the turf fort with the stone one (although it is possible they may equally derive from the curtain wall). The stone (2053) recording work by the Vindomoruci (presumably from the area around Vindomora, modern Ebchester in County Durham) on the other hand probably belongs to the Severan rebuild, when tribal levies are found at work. The paucity of inscriptions from this stretch probably reflects the fact that some three miles of the Wall across Burgh Marsh have never been detected and may not have been available to be robbed for building stone. It is difficult to believe that there were any fewer inscriptions here than elsewhere along Hadrian’s Wall. With only two inscriptions available from the Burgh-nbby-Sands to Drumburgh stretch, and only one of those (2050) legible, it is difficult to draw conclusions about this particular epigraphic corpus. It is interesting to note that the Sixth Legion appear to be viewing the mother goddesses in much the same way as the Lares and Penates, in a domestic role. This altar was found near Milecastle 73, just east of Burgh Marsh, and once more may reflect a legionary detachment acting in a garrison role. As with other western sites on the Wall, Burgh has not exactly been over=productive in its epigraphy. The worship of Belatucadrus (2038-9, 2044) is once again prominent and there is the usual crop of Jupiter altars set up by unit commanders (2041-2). We also find an altar to the rather unusual deity Latis, otherwise found at Birdoswald (1897). The Moors mentioned in 2042 recall the story in the Historia Augusta (Severus 22.4-5) about Septimius Severus’ ill-omened encounter with a black man near Hadrian’s Wall. Other residents from elsewhere in the empire included German troops (2041) and a Dacian (2046). The absence of consolidated lengths of curtain wall is again evident in the paucity of centurial inscriptions in this section. The few centurial stones (2031-3) probably date to the replacement of the Turf Wall in stone under Antoninus Pius. The peltate terminal on the Twentieth Legion’s building stone (2035) betrays the fact that it too is Antonine in date, so belongs to the period between the return from the Antonine Wall and the Severan reconstruction. By far the most interesting inscription is that on the altar set up by the commander of the Sixth Legion (2034) to mark successes ‘trans vallum‘ (beyond the Wall). This confirms other sources which refer to the Wall as vallum (rampart), not murus (wall) as might be expected. The fort of the largest unit on Hadrian’s Wall, the double-strength cavalry unit of ala Petriana, is poorly understood and has not produced the volume of inscriptions of some smaller forts elsewhere. Paradoxically, none of the inscriptions actually mentions the unit, although a cavalryman is depicted on one of the tombstones. The building inscriptions imply the construction in stone of the (originally turf-and-timber) fort by the Twentieth Legion (2028) and its refurbishment by the Sixth (2027) in AD 238–44, but this may be an over-simplistic interpretation. It is certainly salutary that no inscription names the unit in garrison, ala Petriana (which is named in the Notitia Dignitatum). The cavalry tombstone (2030), of the traditional ‘rider’ type showing a barbarian foe being trampled, leaves little room for doubt about a mounted presence here. It’s been a few months, but it is now time for another PLV Podcastellum. This is another interview conducted on the bus in Denmark, this time with Rob Collins, Portable Antiquities Scheme Finds Liaison Officer at the Great North Museum and specialist on Hadrian’s Wall in the Late Roman period (amongst other things; Rob is a versatile lad). 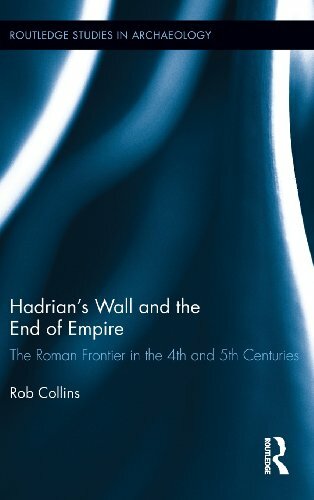 He is the author of the magisterial Hadrian’s Wall and the End of Empire: The Roman Frontier in the 4th and 5th Centuries (which is mentioned in the podcast) but has also exhibited his talents as an editor in a volume about finds from Late Roman Britain, one of the CBA Research Reports, Finds from the Frontier: Material Culture in the 4th – 5th Centuries, which he co-edited with Lindsay Allason-Jones. Turning the tables on Lindsay, Rob has now co-edited a forthcoming Festschrift volume for her with Frances McIntosh, Life in the Limes, which will be published by Oxbow books later this year (which, by a bizarre coincidence, I have ended up typesetting). I hope you enjoy listening to Rob and are not too distracted by the rumble of the bus or the chatter of the others around us. The podcast is available as an MP3 file (65Mb: this one’s a biggie!). If there is enough demand I can create an Ogg Vorbis file too, but you have to tell me you want it. Right click to download. A bit torrent link is also available. Finally, if you prefer, you can stream it directly from the archive.org web page.